Successfully Added HK Warehouse Gretel S55 Android Phone - 5.5-Inch, Android 7.0, 3G, Quad-Core CPU, Fingerprint, 2600mAh, Dual-Rear Camera (Black) to your Shopping Cart. The Gretel S55 is an affordable 3G Phablet that brings along great connectivity. This 5.5-Inch Android phone comes with Dual-IMEI numbers. You will be able to slide in two SIM cards and stay connected to both at the same time. This means that you can always be reached on two phone numbers while using only one device. If you are a busy business man that wishes to separate work and private life, this cheap Android phone is perfect for you. Its 3G support furthermore lets you browse the web anywhere you are. You will always be able to access the internet, stream movies, and make online calls. Android 7.0 treats you to the latest software features available. This means that you’ll be able to enjoy the latest mobile Apps as well as games and videos. With this Android phone at your side, you’ll never have to experience a moment of boredom again. It comes with a Quad-Core CPU and supports 16GB internal storage. The latter of which can be increased via its 32GB SD card slot. The Gretel S55 offers all the power and storage needed to enjoy all the basic software features and games out there. With its 5.5-Inch IPS display, this Android phone brings forth a stunning visual experience. You will be able to enjoy vivid color and crisp details in HD resolution at any given moment. A 2600mAh battery brings along up to 10 hours of usage time. This means you can get through a regular day of smartphone usage without needing to worry about battery life. No matter your mobile demands, this cheap Android phone is sure to treat you to an outstanding user experience at an affordable price. 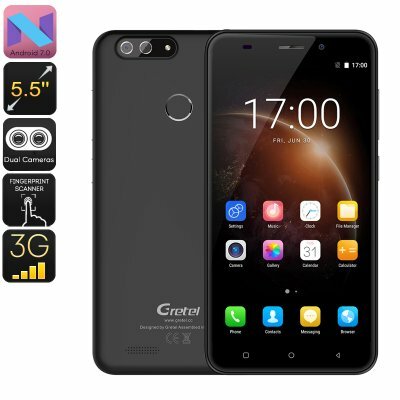 The Gretel S55 Android phone comes with a 12 months warranty, brought to you by the leader in electronic devices as well as wholesale smartphones..